Jacques Cousteau describes the Sea of Cortez as "The Aquarium of the World" and that is exactly why it is now a protected body of water. ......."I Don't Want To Go Home!!!" 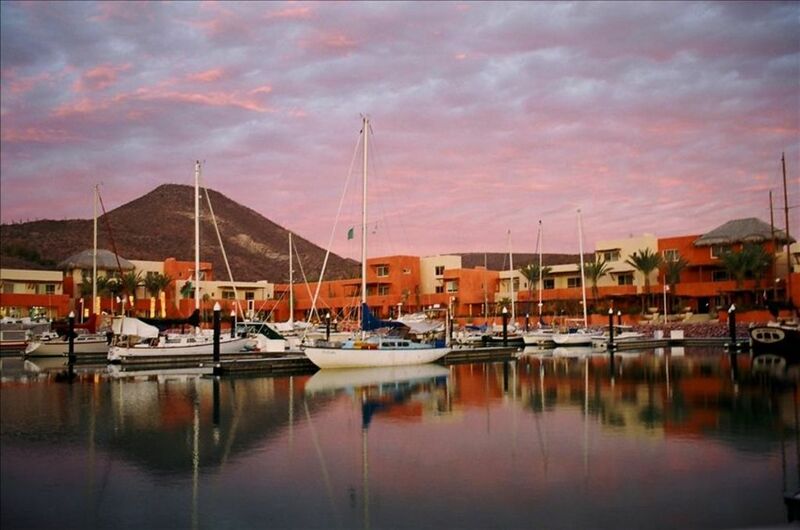 The Costa Baja Resort Marina Village Offers: Int'l Restaurants, Shops, Galleries, Yacht Charters, Fishing/Snorkeling/Scuba Diving Excursions, Rental Car Service and more. And what would you think about a short trip over to Mateos Lopez to not only see the California Grey Whales but actually have a chance to "pet" the whales. Yes, I said pet the whales like I did! Resident Services will be pleased to help you arrange all of this and more. Or take the free shuttle to The Malecon, the beautiful seaside walkway along the tranquil waterfront of La Paz (only 5 minutes away.) Enjoy shopping, dining, strolling and watching a captivating sunset upon the Sea of Cortez. For an added treat, experience The Malecon on a Sunday night - Family Night - and mingle with the locals while the local vendors offer their goods and delicacies. THEN THERE ARE THOSE DAYS WHERE ALL YOU WANT TO DO IS JUST RELAX. Grab your favorite book, perhaps a magazine to brouse through or that Ipod you remembered to drop in your carry-on and take them with you to the elegant, beautiful new MARINA BEACH CLUB. Enjoy splashing around in the infinity pool, lounging in the sun or shade, signaling for poolside libations (love that word)and chatting with good friends and family or consider making new ones. How much more can a relaxing vacation be all about!! Let's put it this way... We haven't brought a person here yet that walked away saying "I want to go home now". What will you say? Come find out for yourself. The new Costa Baja Hotel and Spa has opened in November 2010 concurrently with the Gary Player Signature Golf Course which now brings us the additional amenities offered by the hotel. Some for free like the infinity pool with swim up bar, lap pool, and exercise room but now includes an exclusive and beautiful Spa to enjoy that extra little pampering one needs when away from home. Bring your computer, IPad or Cell phone and take advantage of staying connected as you need. Condo has its own washer and dryer; master bedroom has king bed with private covered balcony; second bedroom has 2 queen beds with panoramic window and private bath. Front Entry Balcony has an unobstructed view of the outdoor Amphitheater. Wonderful condo for kids. Spacious. Approximately 1450 sq. ft. 24 HOUR SECURITY. Perfect location to sight see in and around La Paz! We loved staying in this condo at the marina. There are restaurants just a one minute walk away, a small market, and a lovely beachside pool with a bar/restaurant and great children's play areas, and a beautiful beach. We visited Playa Balandra, Playa Tecolote, and Las Ventanas and of course the La Paz Malecon just 10 minutes away. The property is quiet and secure and we absolutely loved staying here. Thank you so much, and by the way, WE DON'T WANT TO GO HOME!!! This is our second time staying in this condo and we like the location and our grandkids love the pool. We like the option of the restaurants here and love new coffee shop. We will be back! Great place to stay and more that we expected!! My family and I had a great time here and were pleasantly surprised! The condo was bigger than we expected and was very clean. It was perfect for our family of 6! The location was great and had a great view of the marina and surrounding resort. We were able to use the pool, beach club, and amnenities at the Costa Baja resort. There was a shuttle that took us into town and had very nice drivers who were very accommodating. When I reserved this condo the google map on the HomeAway site was incorrect. This condo IS located at the costa baja resort, even though the map shows elsewhere. The only complaints I had were more with the Costa Baja hotel employees and resort itself. They didn’t allow me to fish from the shore anywhere in the marina, beach or any part that was owned by the resort. (I get it, they have rules, but none the less disappointing) They also wouldn’t change currency for me unless I was a “guest” of the hotel. Neither did they allow us to have any tubes or floaties for my kids in the clubhouse pool. The restaurants were quite pricy and I would definitely recommend going into La Paz for just as quality food for much less. We went to a grocery store and ended up cooking a lot of our meals at the condo. Overall the condo was great, but we were not impressed by the costa baja staff, or their rules and attitudes. I would highly recommend the condo, and Dorothy and Dennis were great to talk to and deal with. Thank you!! The condo is located in a beautiful resort just North of town. The facilities at the resort are beautiful. The pool is amazing and there is a small beach as well. The resort has a number of restaurants on site (which we enjoyed). It was nice that you didn’t have to drive somewhere to eat. The marina has a number of vendors that you can choice from for water excursions. The highlight of our trip was the whale shark and seal lion swimming with Baja Adventures company. Unfortunately the condo itself needs a little TLC. The patio furniture is literally falling apart with screws and nails laying on the patio. The unit was also missing the washer/dryer and dishwasher. Fortunately the owner arranged for us to have our laundry done by a service for a nominal fee. The beds leave a bit to be desired. There was also a bit of a hiccup in communicating with the owner. It would have been great to have written directions to the condo. Also suggestions on what to do in the area, where to eat, best way to get a taxi would have been great. Guest services at the condo were not much help. Despite these few things, we had an enjoyable time. Dorothy was a great host. The condo is in the best location in La Paz, with access to some of the greatest amenities you will find. The condo itself was very comfortable, and we felt at home. We would not hesitate in recommending this to all of our friends. Thank you very much! How very kind of you to take the time to offer a review. We look vevto share our home and want everyone to feel comfortable and yet excited about this part of the world. We had a great stay! The pictures don’t do the place justice. It was bigger then we expected and so cozy with a great Mexican feel. The area is so laid back and friendly. Lots of amenities and the beach club is beautiful. Food and drinks are very affordable and the free shuttles make it super easy to head into the Malecon anytime. Getting the keys was easy and Dorothy was great at answering any questions we had. Would stay here again and highly recommend it! Whale Watching, Search for Cave Paintings, Pearls, Agates and artifacts on the local islands within the Sea of Cortez. One Week or more stay will receive discounts. Emergencies may come up. Please let us know as soon as possible if you need to reschedule prior to your stay. A new date will be reviewed and rescheduled.